There has been considerable press comment about an extraordinary memo produced by former Lord Chancellor, Lord Irvine, concerning the process by which the then Prime Minister, Tony Blair,came to decide upon the plans which led to the establishment of the Supreme Court. The memo was produced for the House of Lords Select Committee on the Constitution. Lord Irvine has not spoken out about these events for over six years but was moved to respond by the evidence which the former Cabinet Secretary Lord Turnbull gave to the same Committee in July. The circumstances in which government undertook wide ranging constitutional reform in 2003 have always been controversial. In an oft repeated phrase, Liberal Democrat MP Alan Beith said that the forms “seem to have been worked out on the back of an envelope”. We have already blogged the fuller, more thoughtful, account of the process by Professor Andrew Le Sueur. In the memo Lord Irvine states that in June 2003 he heard rumours of the proposed abolition of the role of Lord Chancellor. He “determined” to see the Prime Minister who, he says “seemed mystified” when he said such a change required consultation with inter alios himself, the judiciary and the Palace and that he was surprised the Prime Minister had “no appreciation” of this. Subsequently and despite his opposition, Lord Irvine submitted a paper to the Prime Minister proposing that he say on to oversee the changes. This was rejected by the Cabinet. In The Guardian on 1 November 2009, Michael White suggests that Lord Irvine’s account may not be the whole story, suggesting that Tony Blair’s chief concern was not constitutional reform but rather to make the criminal justice system faster and more efficient. Although Lord Irvine’s Memo has an authentic and persuasive flavour in relation to the events of the crucial week in June 2003, it does not deal with the background and the build up to this most English of botched reforms. What seems clear is that the falling out between the Prime Minister and his former pupil master, Head of Chambers and political mentor Lord Irvine had deep roots. There appears to have been a “turf war” between Lord Irvine and Mr David Blunkett, the then Home Secretary. In addition, there are “constitutional” arguments about the need for modernisation in which the Lord Williams of Mostyn appears to have played a crucial role – recognised in contemporary press accounts but not mentioned by Lord Irvine (or Professor le Sueur). Doubtless the popular and politically astute Lord Williams recognised the potential difficulties arising from the Irvine/Blunkett conflicts and saw a way of resolving them which was consistent with a long overdue reform agenda. 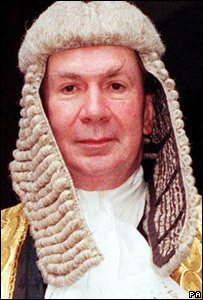 Contemporary reports suggested that Geoff Hoon was to be put in place as Minister of Justice, Lord Irvine says he was told that it was to be Peter Hain. The lack of constitutional awareness of Tony Blair and his advisers – in particular their failure to realise that unlike an ordinary Secretaryship of State, the Lord Chancellor could not be abolished overnight – led to a hasty last minute revision of plans with Lord Falconer left picking up the pieces. Lord Irvine’s memo provides a little more insight into this murky and discreditable episode of ill thought out reform. It will be an important piece in the jigssaw when the full history comes to be written. We have now updated the link through to the memo so hopefully you will now be able to access it in full. Leave a reply on "Lord Irvine speaks out"